October 1, 2017, is a date that none of us will ever forget, and the Department’s response was a defining moment witnessed worldwide. 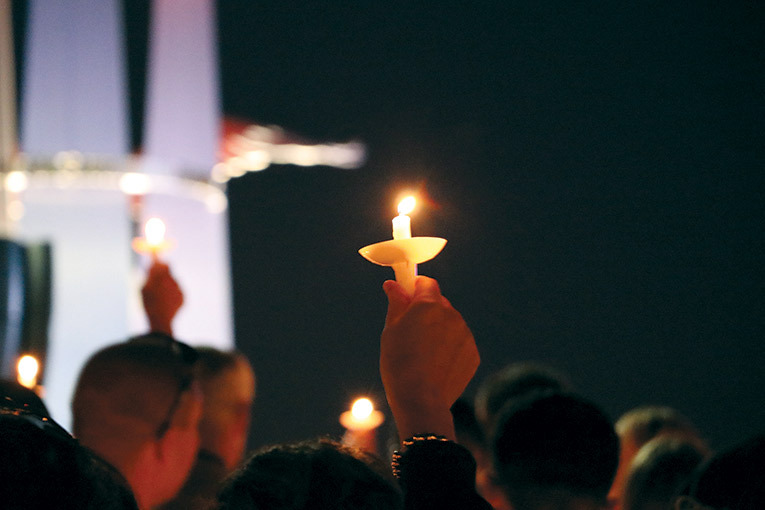 Thousands attended the candlelight vigil for Officer Charleston Hartfield on October 5. Certain events reveal who we are as people, and who we are as professionals. 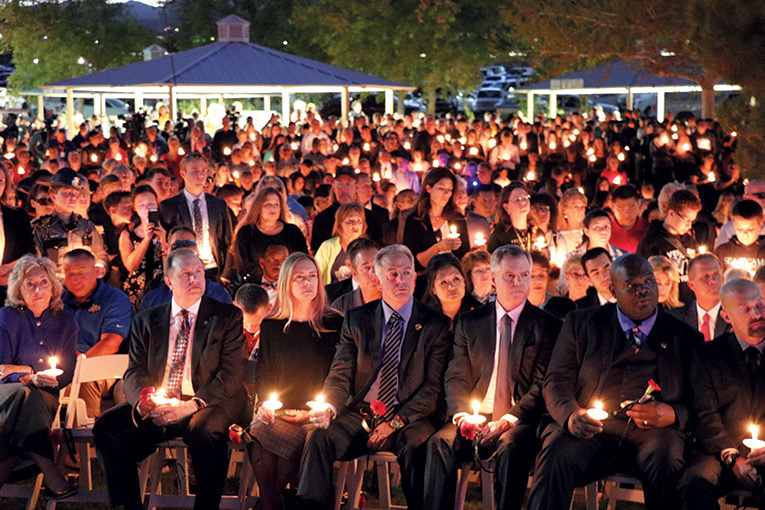 How our members responded to the October 1 shooting did both, and the whole world saw your dedication and courage. 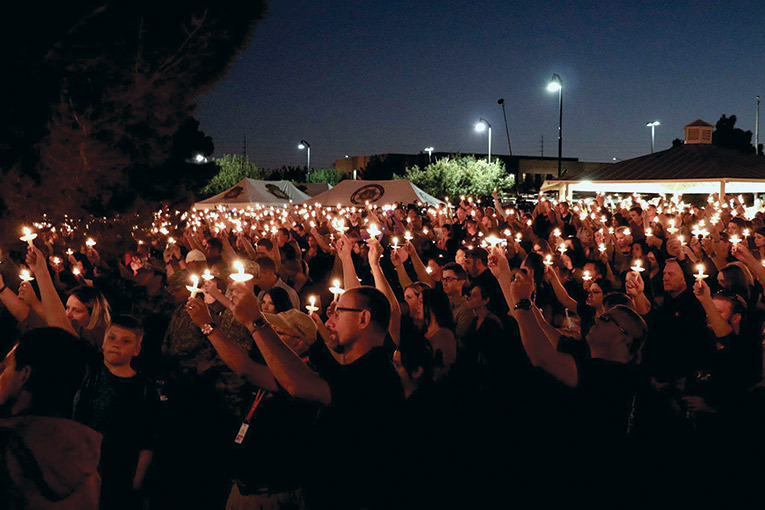 As president of LVPPA, I was proud to represent our members on site in the immediate aftermath of this event, as well as later in the media. 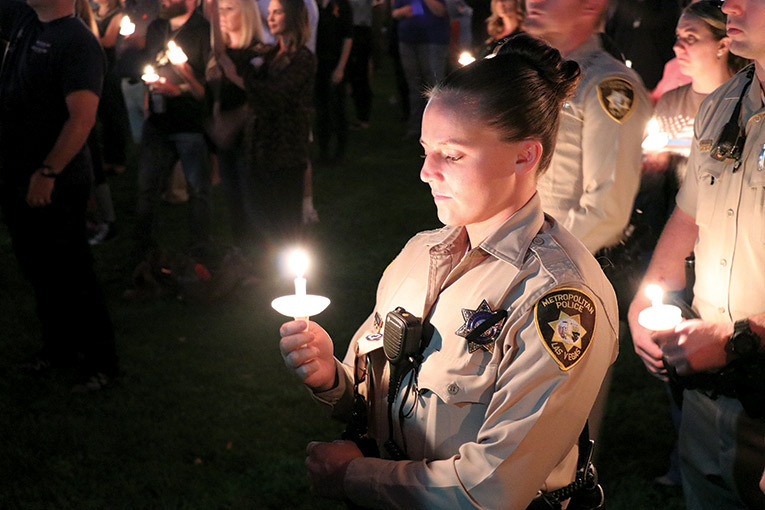 As we process and move on from this event together in the months and years to come, I want to tell you about what I witnessed that night and experienced in the following days — because what it brought home for me is that I am surrounded by the absolute best in law enforcement, and also that we are supported by a community like no other. On that fateful Sunday night, everyone from LVPPA was off shift, and I was at home. My assistant sent me a text asking if I knew what was going on with an active shooter down at Mandalay. I did not. I immediately went out and got my Department radio and started listening to the radio traffic. Once I realized we had an actual active shooter and officers had been hit, I immediately contacted all of my Executive Board members and everybody rolled out in one way, shape or form. Pretty much all of us headed toward University Medical Center (UMC), which is where we believed our officers would end up, and Scott Nicholas rolled out to one of the command posts out by Central Area. Of course, my first inclination — and other Board members’ as well — was to want to go and be part of helping at the actual shooting scene. Personally, having a somewhat tactical background from narcotics, where we conducted our own search warrant entries, breaches, and vehicle assaults and arrests, and knowing that I could probably help in that capacity, I had to realize, “I can’t go out there and do that, because we have another function.” Our job was to find our officers and see if they needed any resources. Out at the hospital, knowing that I could probably bring a little bit of calm, I worked with the captain from Bolden Area Command, prioritizing what needed to be done. Right away, I started trying to locate our officers in the hospital. I ended up finding Officer Brady Cook over in the regular ER, away from trauma, and I eventually found out that Officer Casey Clarkson was over at Valley Hospital. Myron Hamm went over there to be with Casey. Our other guys were rolling down with the RV, so at that point we were ready to do whatever we could to augment the police department with supplies of food and drinks, a place to sit and relax, or to provide information, gather intel or anything else officers needed. We had a large number of people at the main shooting area and the hospital that we needed to take care of, because there were a lot of officers locking down both locations. Meanwhile, Scott was out at the command post, relaying information to us as he was getting it from the incident commanders. It was about 10:30 p.m. when I got the call, and we stayed out there until about 5 a.m. Everyone got a brief little nap and came right back into work at 7 a.m., and we continued to do our thing for the next three days. I’m amazed, but not at all surprised, at the speed and thoroughness of all the first responders who reacted to this event. I think a similar call went out at the Department, but my wife, who works in dispatch, got a text that basically said, “We need people, if you can come in, just come.” And of course, everyone did. 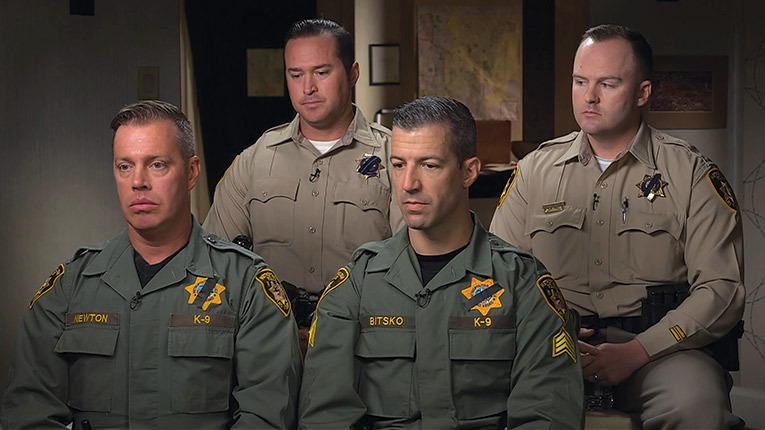 The October 8 episode of 60 Minutes featured interviews with Sheriff Lombardo, Detective Casey Clarkson, Detective Matthew Donaldson, K-9 Sergeant Joshua Bitsko and K-9 Officer Dave Newton. Hundreds of officers converged out there and at the hospitals, while others still picked up calls for service, because of course the town doesn’t totally shut down and there were other police functions that needed to be conducted. Off duty or on duty, everyone at the Route 91 concert right away kicked into cop mode and started evacuating folks, getting people to safety and seeing if they could identify the threat. From what I’ve heard, plenty of off-duty officers literally just grabbed their uniforms or gear and drove to wherever they could to go help. I’ve always known that’s what they would do, everybody associated with this Department. These are people who care about our city, our community, our officers and our citizens, so whether they are at home enjoying a TV show or hanging out and having some time with their family, when that call goes off, that’s where everyone’s heart is at: to go help. It confirmed what I’ve always known, which is that we really are a family, and we stick together and we have each other’s backs. Immediately when we heard the terrible news about our brother, Officer Charleston Hartfield, we knew we had to make sure that the world knew the true hero behind the badge. So the day after the shooting we started planning a vigil for Charlie and his family. That was a hectic week for us, getting everything in place, and the Injured Police Officers Fund (IPOF) was instrumental in helping us put that event on and make it a success. Seeing the thousands who came out to honor Charlie for this tribute just showed what an impact he had during his life. He will never be forgotten. 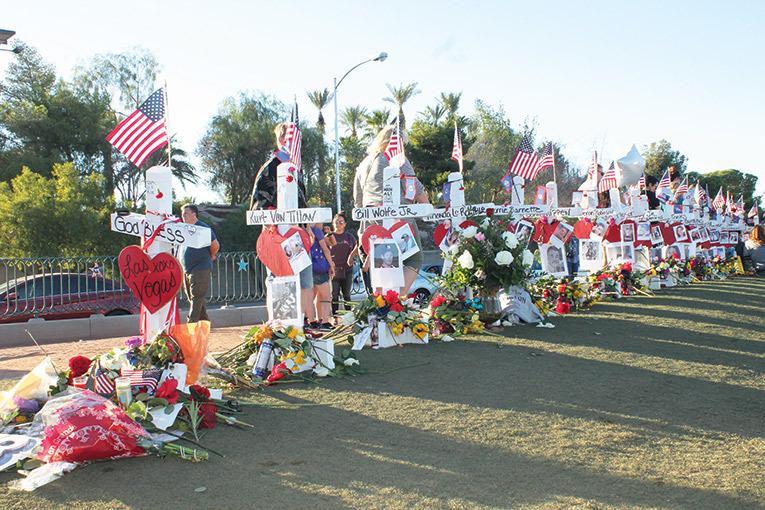 Retired carpenter Greg Zanis built 58 white crosses and brought them to Vegas to set up as a memorial to the victims of the shooting. He has created about 20,000 crosses for such tragedies across the U.S. since 1996. Now we are in the middle of interviews with the Force Investigation Team. It seems like daily we have five, six or seven interviews of officers who were on the 32nd floor, on the scene, or were otherwise involved that night. So we’re responding to what Metro is obligated to do in this process. There’s going to be an internal investigation on what happened, so as a union we’re going to stand by our people and make sure that your rights are protected and not being violated, that interviews are going according to plan, and that you’re not asked things that aren’t pertinent to the investigation. While the focus right now is on the criminal side, we will be watching out for you if questions are raised like, “Hey, why didn’t this person have their body cam on?” Another thing we will help with is equipment. We know some officers’ equipment was ruined while they were trying to save victims and injured parties, so we’re trying to make sure that you get replacement gear. Ongoing, we want all of you to know that if you need someone to talk to or if you need any kind of help, we’ll find that for you. We’ll make sure that you’re ready to go back to the streets, not just physically but mentally. We can all take comfort in the fact that our community has really stepped up in the aftermath of this event. The outreach and support for law enforcement has been so far beyond what I could have ever imagined. You look at headquarters and every area command — they were stocked with food and water, delivery after delivery. There were the businesses that donated tickets, like the call we recently got from Golden Boy Promotions for a boxing match. 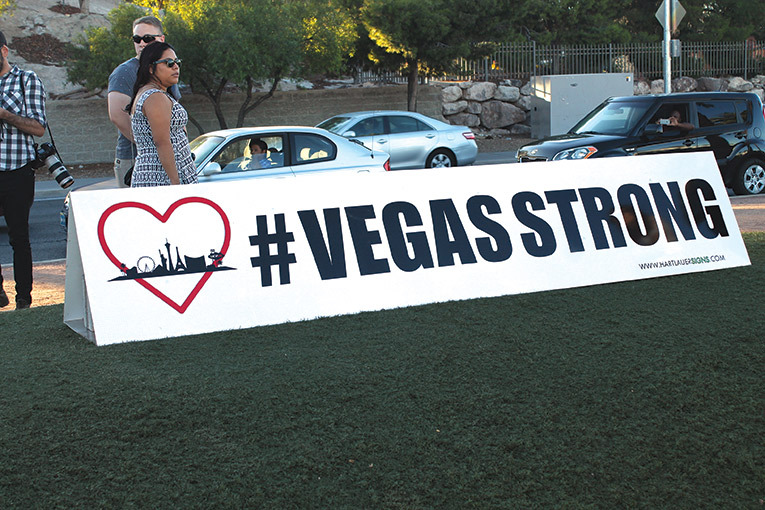 UFC and UNLV held tribute nights, with the UFC kicking in free tickets for first responders. 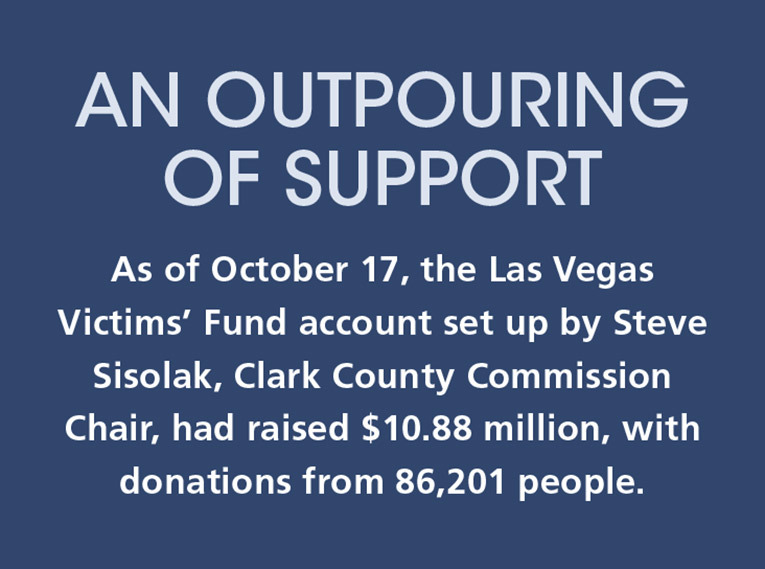 Then, of course, there are the ongoing donations to the GoFundMe accounts for Charlie and the victims. It just shows that no matter what we’re going through in this community, and whatever barriers or divides there may be, when the chips are down everybody comes together — and the world saw that. 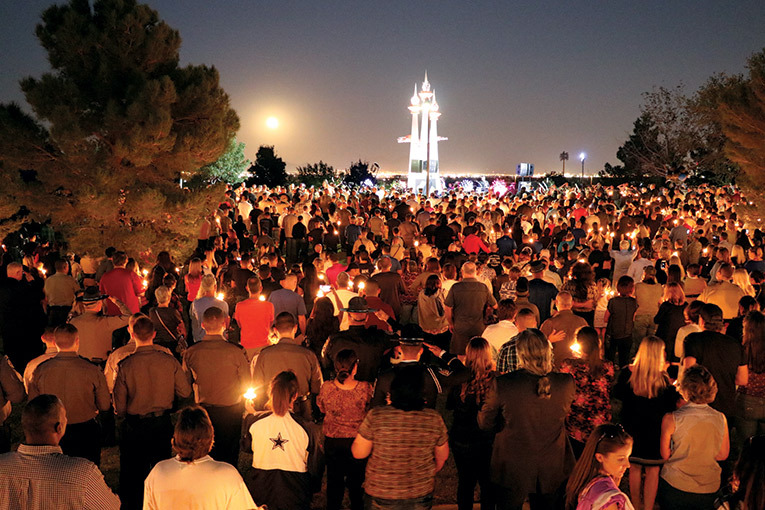 Las Vegas came together and showed that we’re not just a tourist destination, we are a family as well. The outpouring has been amazing and it hasn’t stopped. I’ve had people reaching out to me from different states, cities, police departments and police unions across the country. A group from South Carolina called to say that the kids in their local schools want to make cards for all the officers and first responders and send them out. I got an anonymous check from a Marine Corps and law enforcement veteran who said, “We want to donate to your charity so that we can do something to help you guys out. We come to Las Vegas and visit, and we think that it’s the right thing to do.” Pro baseball players Kris Bryant and Bryce Harper made a PSA in support of Las Vegas, their hometown, and Harper played in Las Vegas-themed cleats. Our law enforcement community has also been incredible. 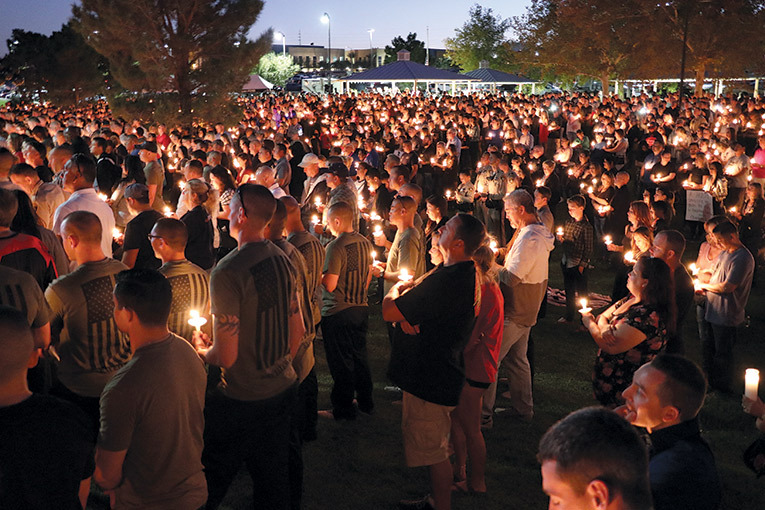 From the North Las Vegas and Henderson departments to the leadership of the National Association of Police Organizations, everyone has reached out with condolences and offers to help, including NAPO President Mick McHale from Florida, NAPO Vice President John Flynn and Police Benevolent Association President Pat Lynch from New York, the Phoenix Law Enforcement Association and officers from the Dallas-Fort Worth Police Department, among many, many more. As you probably know, Dallas-Fort Worth officers were actually here and attended the vigil for Officer Hartfield, along with officers and representatives from coast to coast, letting us know that they are here for us. The thin blue line holds strong. 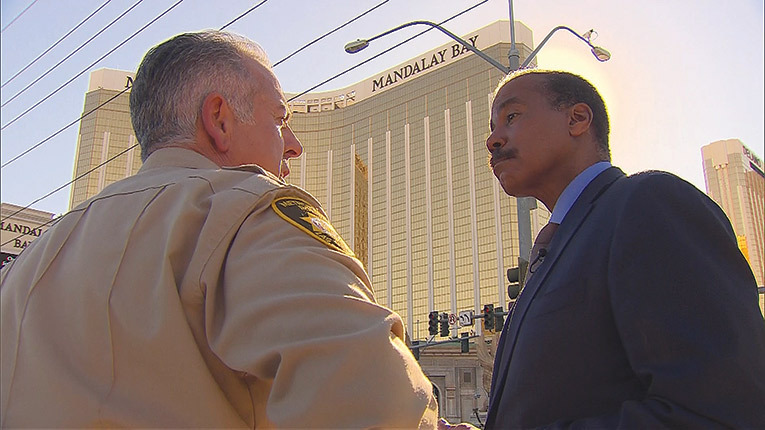 This event shows that while you can never be wholly prepared for something like an assailant with an arsenal in a high-rise hotel, our training at LVMPD is probably the best in the country. Our people knew exactly what they were doing. Once they identified the threat up on the 32nd floor, officers went into action and dealt with it. This event will both raise our situation awareness and spur new training scenarios. We have done plenty of training for active shooters, but a lot of that active-shooter training has been for someone at the ground level. Obviously, there are different tactics that need to go into taking on someone from a high position, since you can engage a ground-level shooter with your weaponry to stop the threat, but you can’t go shooting rounds 32 floors up into the air hoping you can get on target. So training will have to address adapting and adjusting to a high-rise situation, especially with our strip developed the way it is. From Russell down to U.S. Route 95, you have hotel after hotel, all offering a high vantage point where some assailant could go. It’s possible the suspect had plans at the Ogden Hotel downtown, too, so we just don’t know where an incident could happen. 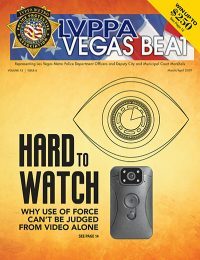 But the LVPPA will be advocating for enhanced training to ensure that officers of all ranks are as prepared as possible for the variety of situations they could encounter. I think this shows that across the country, we need to reconsider how we’re identifying some of our suspects. After 9/11, I think we got accustomed to thinking that if there was a terrorist attack it was likely perpetrated by a person of Middle Eastern descent with some ideological characteristics. Well, this guy was a wealthy white male with no indicators and nothing popping off the charts, but he went crazy and did what he did. So we have to understand that we don’t necessarily know who the assailant’s going to be, and just plan for where those events could happen and how to address it depending on location. 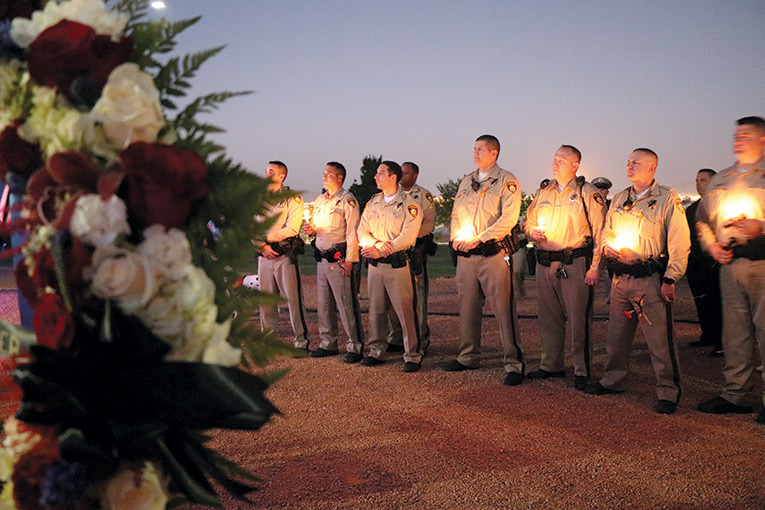 Because of the professionalism displayed by everyone on the Department, I think that if someone is thinking of joining a law enforcement agency, the LVMPD is where they are going to want to be. We’re one of the best agencies in the entire nation, if not the world. 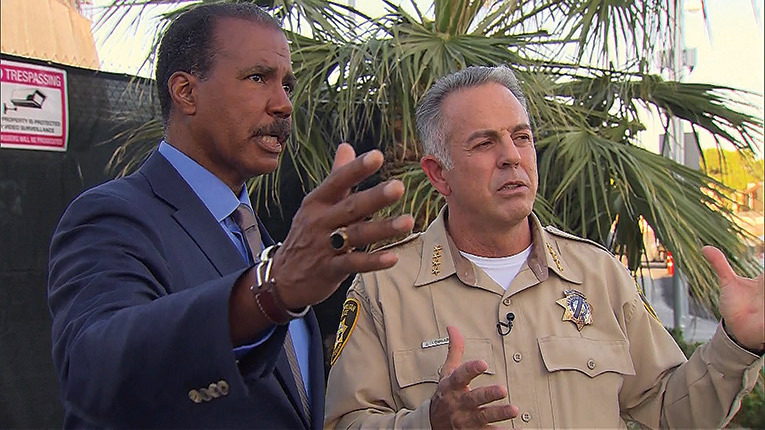 In fact, applications to LVMPD were about double the normal levels after the shooting, with the Department receiving over 850 applications within two weeks. One of the best things that is going to come out of this is that more people are going to want to be involved, engaged and helping others here in the community. We saw what kind of bad things can happen, but we also saw the best, when people joined together and helped — the civilians, police department, fire department, EMTs and hospital workers. I can’t say enough about everybody who came together. I walked through the ERs at Sunrise, UMC and Valley hospitals, and to see those hardworking, dedicated doctors, nurses, caregivers and everybody else involved was just amazing. It was not just a police issue, it was an everybody issue. There’s a feeling of “we’re all in this together” after this event that I think is going to make us a better and stronger city in the long run. Thanks again to all of you for your dedication to duty and courage under fire. 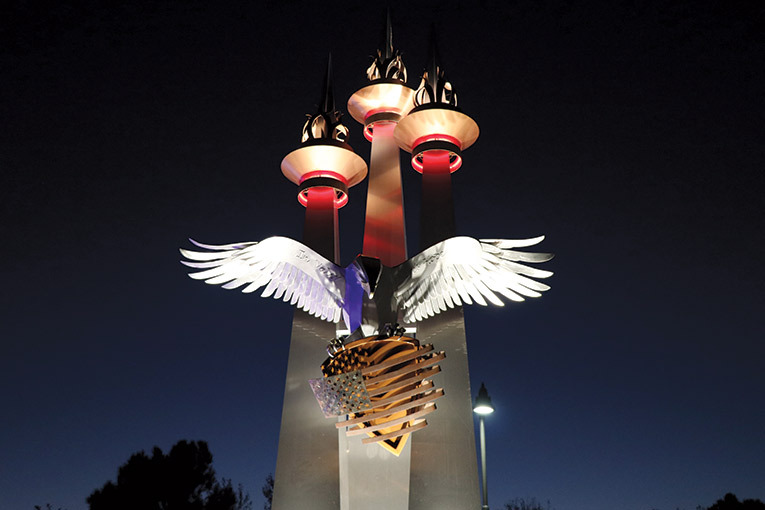 We are Vegas Strong.